The team sought to develop new sustainable products with recycled automotive parts, by turning buckle tongues into bottle openers (FördeÖffner) and seat belts into fashionable bags (FördeTaschen), marketing them as “products of great authenticity”. They also won the FedEx Access Award. 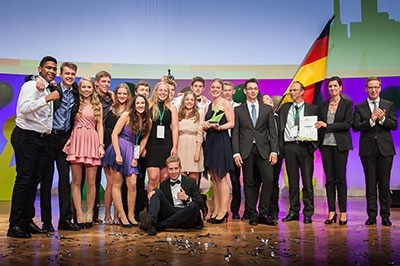 On 28 – 31 July, over 200 COYC students gathered in Berlin, Germany to celebrate the top mini-companies from across Europe. 37 student-teams from 36 countries competed as part of JA Europe’s flagship Company Programme, which gives them an opportunity to set up and run a real business with the support of business mentors. In the 2014-2015 school-year more than 275,000 students participated in the JA Europe Company Programme. Learning to run a company from top to bottom, these students created and marketed real products and services. The success of the programme is largely due to the wide support from business volunteers, who act as mentors, offering expert advice to the students. Partnering education and business is essential to closing the gap between classroom theory and real-world business. “The JA company program takes students out of the classroom into the real economic world. Providing an entrepreneurial experience to the students it delivers the best learning effect and prepares for a future career. For what distinguishes entrepreneurs from people who have an idea? Entrepreneurs go out there and do it. And the entrepreneurial spirit to do so, is something that the jury wanted to see. And hosting it in Berlin in the 25th year after the German re-unification is a sign for the freedom that we have in Europe today, the freedom to follow your dreams and try again every single day.” - Prof. Dr. Michael Hüther, Chair Judge COYC 2015, Director of the Cologne Institute for Economic Research and Chair of JA Germany, the event host. Since its start, the JA Europe Company Programme has worked to equip over 3.5 million students across Europe with the right skills to start-up or become gainfully employed. Research has shown that alumni of the Company Programme are more likely to start their own business and have a higher average income than their counterparts. ‘Citi Remarkable Customer Service Award funded by the Citi Foundation’ recognises student enterprises that excel at creating value for customers, listening to customers and walking in their shoes to understand their world, and being able to anticipate and serve customers’ changing needs and work to achieve their satisfaction. ‘MetLife LifeChanger Award’ recognises student companies that best embrace the concepts of social impact, financial performance and innovation in their business strategy while remaining a realistic plan in today’s marketplace.